The Russian government withheld intelligence from the US on one of the Boston Marathon bomb suspects that may have led to further scrutiny before last year's attack, US media report. In 2011 Russian officials warned the FBI about ethnic Chechen Tamerlan Tsarnaev, who was a US resident. But Russia declined requests for more information on him, the reports say. Twin blasts killed three people and hurt more than 260 last April. Tsarnaev later died in a police shootout. Before the bombing US authorities were aware of Tsarnaev - a radical Muslim - but decided he posed a "far greater threat to Russia" than to the US, the New York Times says. According to an inspector general's report reviewed by the Times and other US media, the Russians told the FBI that Tsarnaev "was a follower of radical Islam" and "had changed drastically since 2010 as he prepared to leave the United States for travel to the country's region to join unspecified underground groups". But according to the inspector general's report, only after the bombing did the Russians provide the FBI with additional intelligence, including an intercepted telephone conversation between Tsarnaev and his mother in which the two discussed what was described as Islamic jihad. Tsarnaev, 26, and his younger brother Dzhokhar, 20, immigrated to the US from Russia as children and were reared in the Boston area, ultimately settling in Cambridge. Tamerlan Tsarnaev was killed days after the 15 April bombing while trying to evade capture. 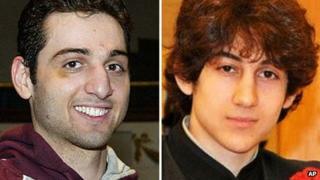 Dzhokhar Tsarnaev was shot by police but caught and charged with terrorism in connection with the bombings. He faces the death penalty if convicted. A separate internal review conducted earlier by the FBI found agents had not conducted a more thorough investigation of the Tsarnaevs before the bombing because of federal laws limiting surveillance. The report was shared with the House Intelligence Committee on Thursday, and parts are expected to be released to the public by next week. "We will always ask ourselves what more we could have done to prevent this or another tragedy," said Representative Dutch Ruppersberger, the top Democrat on the panel. "What we may never understand is why the Russians didn't share more with us to aid in the FBI's investigation." But another Democrat, Representative William Keating, said: "The US should not be reliant on Russia to provide domestic security." The report also reportedly found that procedures for sharing information with local police was lacking.